Including a pool or spa can be a wonderful addition to your outdoor oasis! 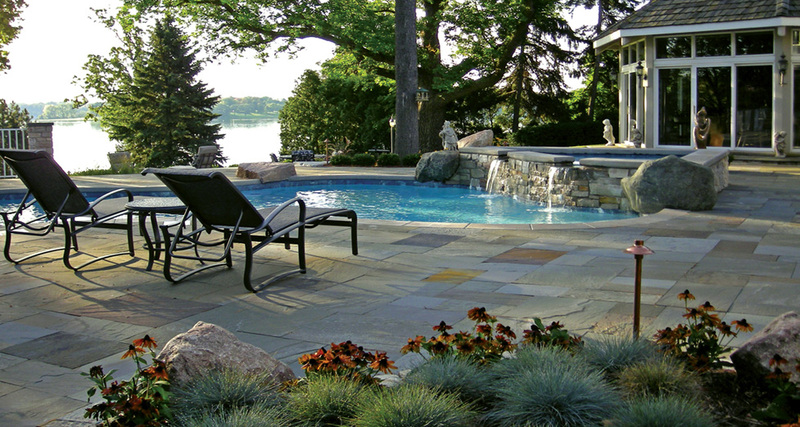 Yardscapes specializes in creating pools that fit in to your lifestyle. 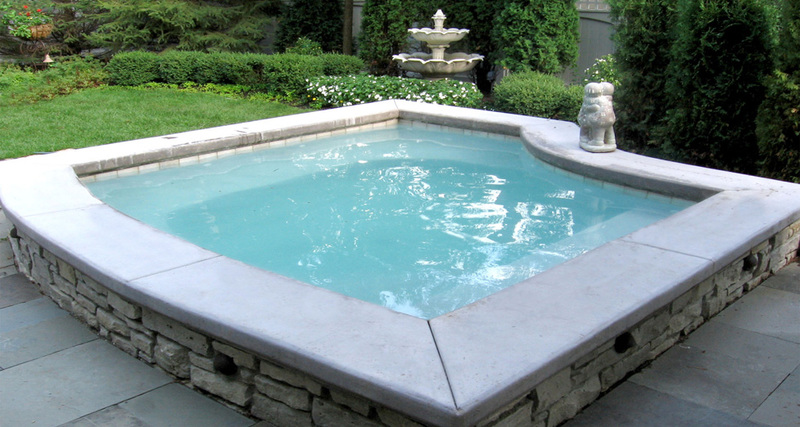 Concrete swimming pools and spas are the most adaptable and customizable. 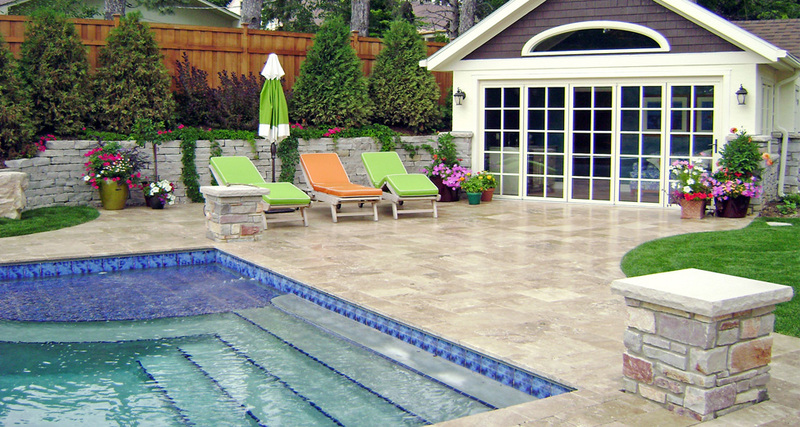 We also design and install vinyl pools, which are a less expensive alternative to concrete. When designing pools we take the environment into consideration and discuss options of vanishing edges, sundecks, benches, diving boards, and slides. 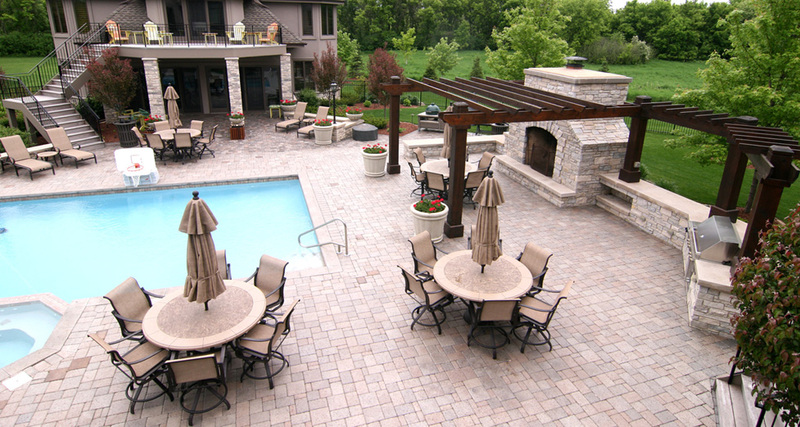 There are a variety of pool decking, such as pavers, natural stone (limestone, bluestone, travertine), wood decks, and stamped concrete. Here are the answers to the most common questions clients have. When a client expresses interest in designing a pool, we first check the city codes to make sure your property will be able to support such a structure. There are many guidelines and each city has different ones, whether it’s property set-backs or the height of a surrounding fence. Once we determine all of the codes, then the fun begins and we can be as creative as the homeowner would like us to be. Swimming Pools: Vinyl vs. Concrete, Which is the Best Choice for Me? We get asked this question quite often. Vinyl has improved immensely over the past 5 years to compete with the look and feel of a concrete pool; but when you get down to it, it is about timeframe, price point, and how custom you want your swimming pool to be. Concrete pools do take 3x the length of time to construct, but are customizable to look and feel the way you’d like; from sundecks, sunken/connected spas, customized tile, benches, curves/angles, small/big, textures – you name it, it can be done. Vinyl pools do allow some customizing with liners, benches, and stair choices. Long term maintenance is about the same; after about 10+ years a vinyl pool may require a new liner and a concrete pool may require resurfacing. If you took a rectangle pool around 40’x20’ the cost of a concrete pool would be about 30% more expensive than a vinyl. The one nice thing that concrete and vinyl pools share now are the ability to have auto covers installed, which help with heating and keeping your swimming pool clean. Ultimately, when it comes down to the decision making, I would make a list of what is important to you and what your budget and timeframe look like. Make sure you choose a designer and installer that are well seasoned and can help you make the correct decisions. "Neighboorhood Home" Required a Custom Concrete Pool to Fit in the Space Without Taking Over the Entire Backyard. 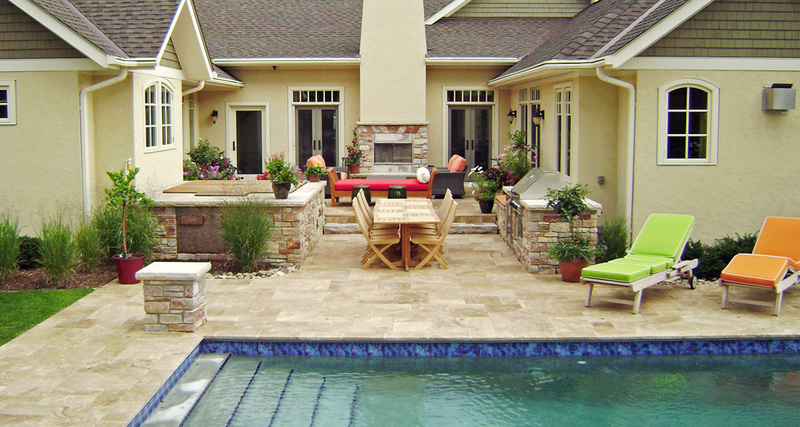 A "Dream" Entertaining Area with Custom Concrete Pool and Spa, Outdoor Kitchen, and Fireplace. Raised Concrete Pool with Limestone Detail and Travertine Patio. Limestone Tiered Walls with Plantings. "Custom Remodeled Backyard" with a Custom Pool/Spa, Fire Pit, Limestone Walls, Paver Terrace, & Plantings. 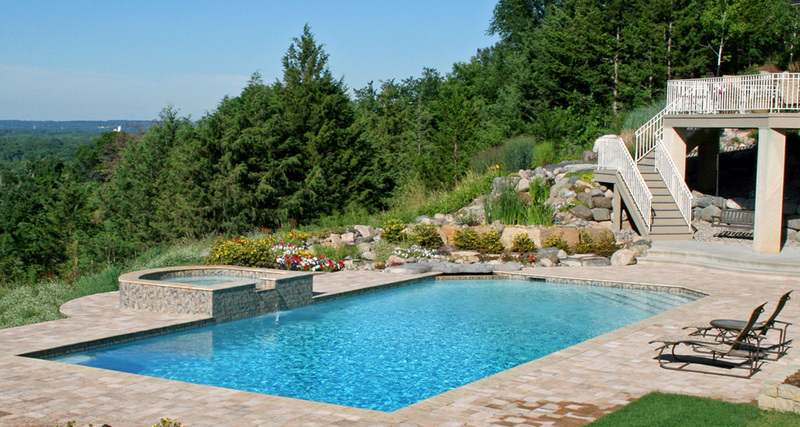 A "View from the Top" of this "Stylized" Custom Concrete Pool, Limestone Walls, & Paver Patio. "St. Paul Home" with all the Amenities of a Large Property Home. Concrete Pool, Kitchen, Fireplace, and Spa. Custom Concrete Pool with a Submerged Sundeck, Limestone Pillars, Travertine Pool Deck with Pool House. "Spa/Dipping" Pool was Built Slightly Larger than Your Average Spa, with a Mortared Limestone Exterior. 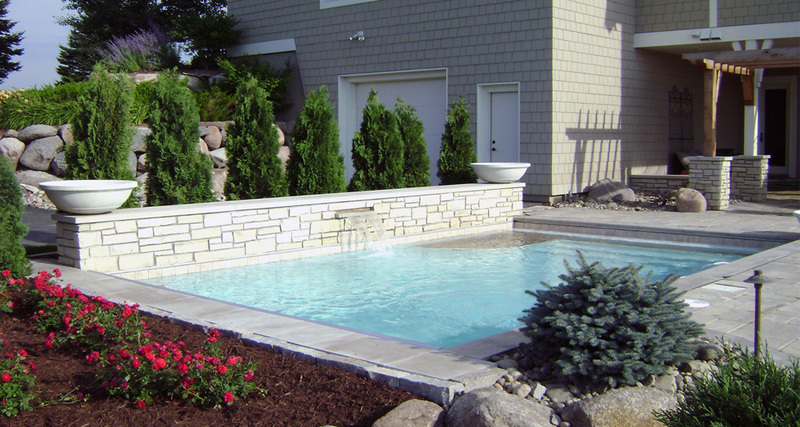 This "Redesigned Pool" had an Existing Shell that We Carved Away at to Create This Beautiful Pool/Spa Combination. Custom Concrete Pool with Submerged Sun Deck and Stamped Concrete Pool Deck. A View Thru the Submerged Pool Deck to the Custom Water Fall into the Pool. 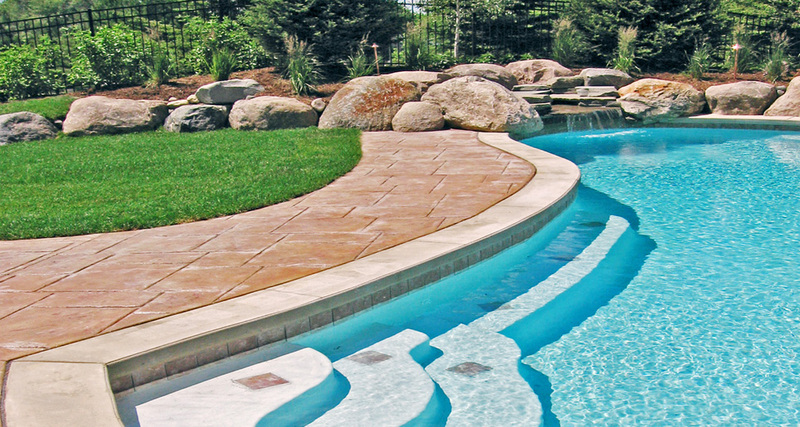 Curved Stamped Concrete Pool Deck Accented with Curved Pool Steps and Boulder Water Fall. This Custom Concrete Pool Accents the "Curves" of the House & Blends into the Paver Patio. 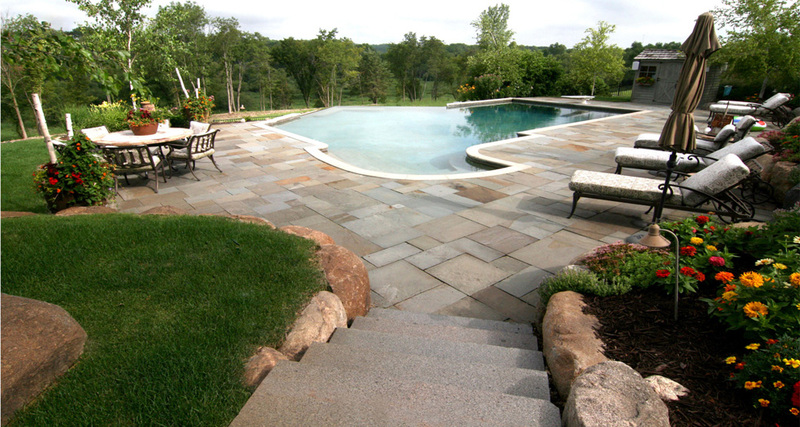 Granite Steps & Bluestone Patio Around the "Expansive" Pool; Which Feels Like You Could Swim Right into the Forest. This Beautifully Constructed Concrete Pool was Built-in to a Wood Deck Overlooking a Small Lake. 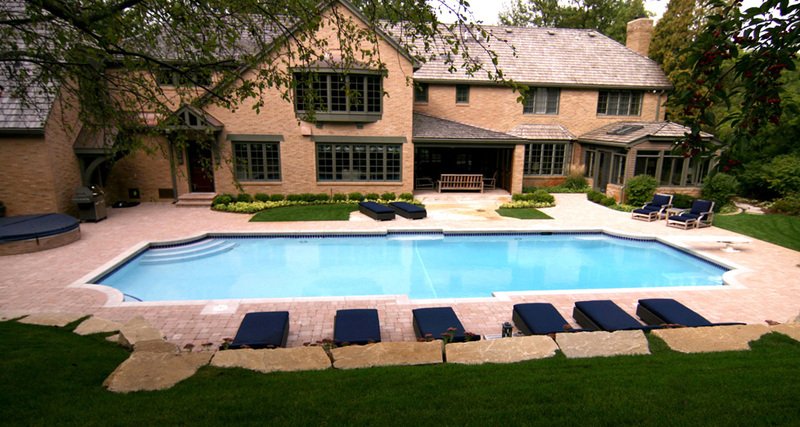 This Custom Pool and Spa was Enhanced by Adding a Natural Water Fall & Paver Pool Deck. 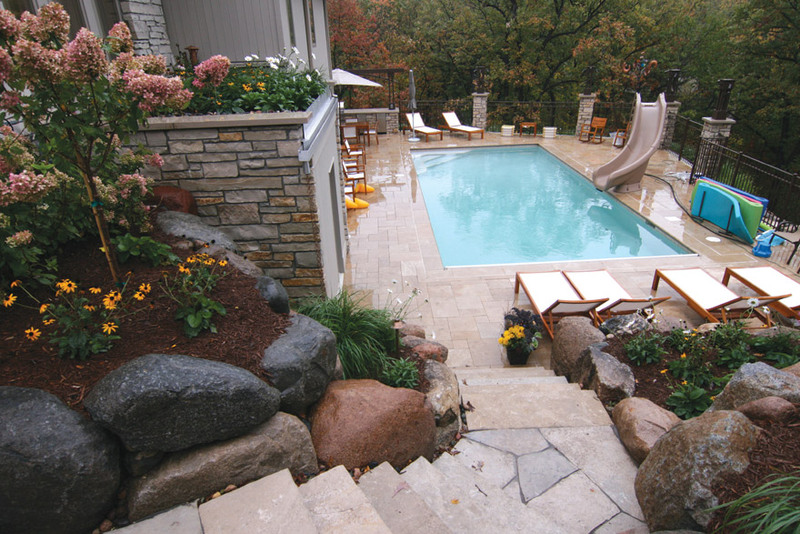 This "Farmstead" in S. Minnesota was Designed with a Large Pool/Spa Combo, with a Limestone Patio.